With it's unique design and gorgeous, dual-color LED lights, there's no doubt that the Thermaltake DuOrb CPU Cooler will immediately catch your eyes. Then, once you get beyond the aesthetics, you'll realize there's some awe-inspiring quality here in addition to it's swoon-worthy good looks. 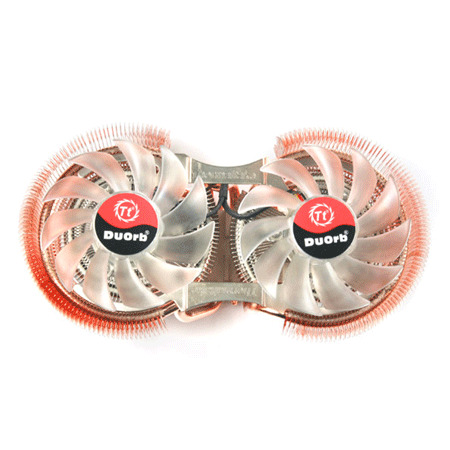 The DuOrb CPU Cooler features an all copper cooling system with an eye-catching Dual-Orb design, which comes courtesy of a patented design which consists of two separate fin configurations. Each Orb of the cooler utilizes a heat pipe to connect the base to its copper fins and an 80x15mm Scurve blade fan to drive the air. Offering a design concept that expands upon the successful features of the VGA Cooler, the DuOrb's Dual-Flow Design further utilizes system air flow to cool down surrounding temperatures, dissipating the heat of CPU, RAM, VRM, North Bridge, and the back of the VGA card. It's Red-Light Orb cools the RAM area, while the Blue-Light Orb cools the CPU surrounding area. The utter hotness of the DuOrb achieved through 6 X Red & Blue LED illumination, truly setting this Thermaltake CPU Cooler even further away from the pack.